NEW YORK (April 20, 2011) – Light welterweight Nick “Hands of Gold” Casal and unbeaten lightweight Amanda “The Real Deal” Serrano make their Boxing 360 debuts Friday night in Hamburg, New York. “We’re looking forward to watching them in action under the Boxing 360 banner,” Boxing 360 CEO & Founder Mario Yagobi said,”We want to thank promoter Juan Santiago (Don Juan Fighting Promotions) for putting our fighters on his card. Nick is fighting close to his home in Buffalo and everybody’s anxious to see him back in the ring after a long absence. It wasn’t easy finding a suitable opponent for Nick because he’s so talented. Nick had some personal issues in the past but he’s fully focused now on his boxing career. He’s only 25 years old but experienced having had 26 pro fights. Casal (29-4-1, 15 KOs), who was a highly decorated U.S. amateur, returns to the ring for the first time since November 6, 2009, when he won an eight-round decision against Christopher Fernandez. His opponent Friday night in a six-round bout is veteran Martin Tucker (7-8, 3 KOs), who was the third different fighter to accepted the fight against the gifted Casal. Tucker has been somewhat of a gatekeeper for the 147-pound division having fought top prospects such as undefeated Sharif Bogere (19-0, 2 KOs) and Ivan Popoca (15-0-1, 10 KOs), and he also upset previously unbeaten Michael Torres (13-0). In 2004, Casal turned pro and he was unbeaten in his first 17 pro bouts, including a pair of draws. Nick extended current WBC Silver champion Antonio “Tony” DeMarco, former WBC Interim light titlist, the full 10 rounds in 2002 in a losing effort (94-96, 93-93, 97-93) that still demonstrated his vast potential. The 23-year-old Serrano (8-0-1, 4 KOs) was born in Puerto Rico, but she now lives and fights out of Brooklyn. The slick-boxing younger sister of former lightweight contender, Cindy Serrano, faces former IWBF champion Ela “Bam Bam” Nunez (9-8, 2 KOs) for the third time. They fought to a four-round draw in 2009, marking the lone blemish on Amanda’s pro record, and Serrano won a six-round decision (59-55, 59-55, 58-56) this past January. Their trilogy fight is scheduled for six rounds. 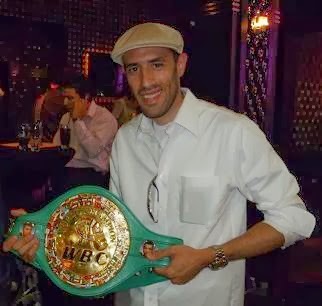 Both fighters are world rated: Serrano WBAN #3, WBC #4, GBU #5 and WIBA #6, Nunez GBU #4, WBAN #7 and WBC #11. WBC No. 3 super bantamweight Leon “Hurry Up” Moore, NY State super middleweight title-holders, middleweight Lennox “2 Sharpe” Allen and welterweight Danny Sostre, KO king Tyrone Brunson, middleweight prospect DonYil Livingston, Joshua “The Juice” Harris, Emad Ali, Angel “Toro” Hernandez and “King” David Estrada. Go to www.Boxing360.com for more information about Serrano, Boxing 360 or any of its other fighters, as well as its scheduled events.